free travel before unlocking free travel to permit blowback minor experimental changes to the gas orifice or other individual parts. It will usually be found that to accomplish any real improvement, a fairly extensive redesign of the entire gun will be required. The analysis up to this point has been concerned with the basic factors affecting the amount of piston energy obtainable and the timing of the piston travel. The next subject for consideration is related to the conditions under which the piston transfers recoil energy to the bolt in order to speed the bolt rearward. There are a number of things which affect bolt velocity. 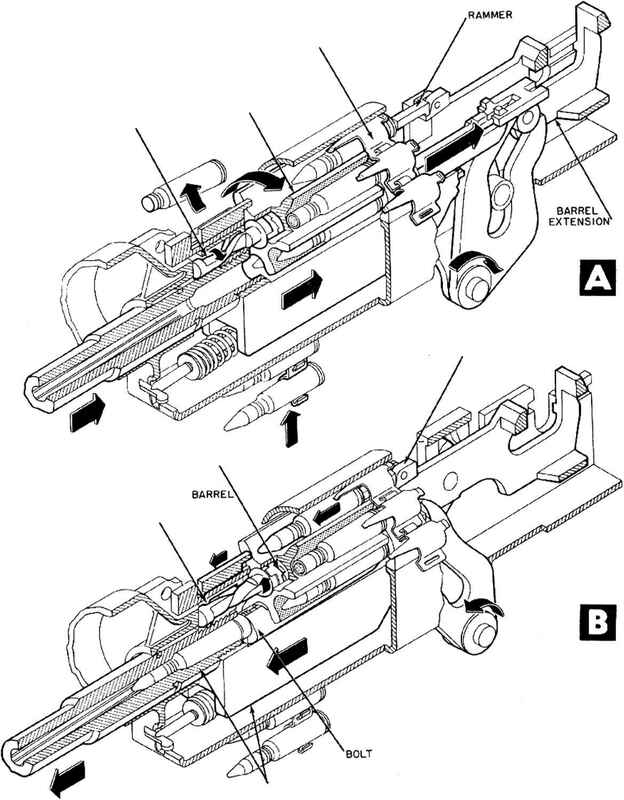 First, since the entire gun is permitted to recoil for the purpose of reducing the forces on the gun mounting, the bolt is unlocked while all of the recoiling parts are in motion. Although it is sometimes desirable to think of the subsequent bolt velocity and piston velocity as being measured relative to the barrel parts, it is always well to remember that the absolute velocity of the barrel parts changes with time. The recoil velocity attained before unlocking is dependent on the total mass of the recoiling parts and on the magnitude of the impulse imparted to these parts by the propellant explosion up to the time of unlocking. (The retardation of the barrel spring will have such a small effect up to the time of unlocking that the action of this spring can be ignored for the present.) The magnitude of the im pulse imparted by the propellant explosion is determined by the interior ballistics properties of the particular cartridge-and-barrel combination employed. Generally speaking, the more powerful the cartridge and the longer the barrel, the greater will be the impulse. The recoil velocity produced by the impulse is inversely proportional to the weight of the recoiling parts; that is, the lighter the recoiling parts, the higher will be their velocity. Thus, with a powerful cartridge, long barrel, and light recoiling parts, the recoil velocity and recoil energy will be correspondinglv high.